During the war period defense spending can be broadly categorized into three bins; base budget, overseas contingency operations (OCO), and other. 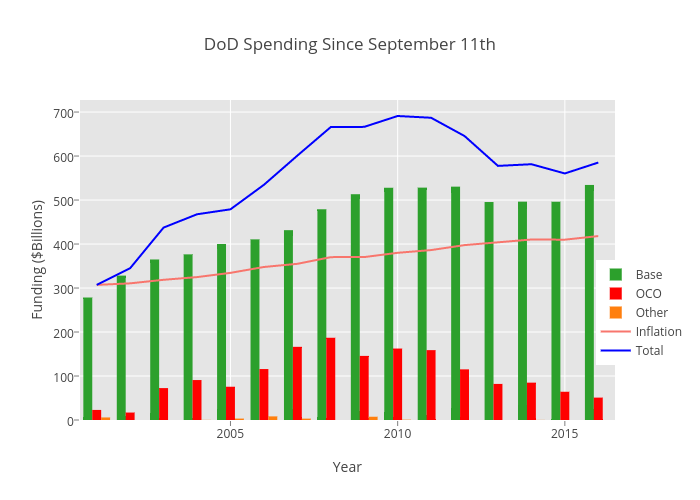 Here is what each category of defense spending looked like since 9/11. The chart is interactive so scroll over anything of interest for more information. OCO is appropriated by congress and intended to directly support the war efforts. However, you can see that even the base budget increase out stripped general inflation (based on CPI) since 2001. While OCO decreased as troops withdrew from conflicts in Iraq and Afghanistan the current budget remained significantly higher than pre-ware levels. There are logical arguments for these expenditures such as; counter terrorism, cyber warfare and continued special operations missions. Each of these new and continuing missions require significant spending to perpetuate. But where does all this money go? I have, for the past year, been working in the national capital region (NCR) and can say without a doubt it is the most interesting place I have ever lived. My current job requires that I balance between three groups of people with varied incentives; military, civilian and contractor. The later is the most curious of all. If I had to give a high level description of contractors from the military point of view, it would go something like this. Contractors are hired because they can easily be fired. However, they do the lions share of the work. In addition, the contractor population easily dwarfs the military and civilian groups combined. So, what is a contractor? The term contractor (in the government sense) is a pseudonym for; person whose job exists because some organization won a government service contract. Then said organization hired that individual to fulfill the contractual obligations. With the defense industrial base providing both products and services for a government branch that has had plenty of money to spend large profits are inevitable. This past 14 years has been incredibly lucrative for companies that won government contracts in the defense sector. More so than anyone could have imagined. When President Eisenhower warned of the military- industrial complex he was directly referring to the condition we currently find ourselves in. Our country has built a significant economic foundation, in particular regions, based on what the federal government spends on defense. Much of this spending can not easily be undone. What most people may not know is how much of the defense spending has influenced the stock performance of some of Americas largest firms. In particular, people the NCR refer to the largest companies that pursue federal government defense contracts as “The Big 5.” All of these companies are publically traded and report directly to share holders. They are; Lockheed Martin, The Boeing Company, Northrop Grumman, Raytheon and General Dynamics. How the current Big 5 came into existence is an interesting story. In the 90’s, a peaceful decade, the defense industry experienced an unprecedented consolidation of contracting companies. The following image shows some of the significant amount of acquisition progression during this time that resulted in the Big 5 (and others of note; UTC and Honeywell) as we know them today. The formation of The Big 5 companies was well timed from a historical point of view. If your company was uniquely suited to win defense contracts after September of 2001 then business was very good for nearly a decade and a half. However, when America deployed to Afghanistan no one could have predicted just how long the wars would take. With a little bit of hindsight we can look back and see how well the defense contractor stocks did on the public market. 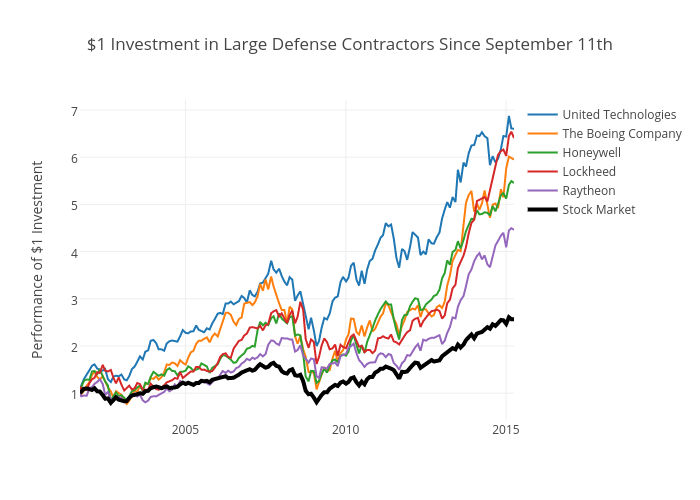 The following chart shows how $1 invested in a few of the Big 5, UTC and Honeywell performed over the formal war period compared to the general stock market (S&P 500). This period ranges from September 11, 2001 to present operations in Afghanistan (The Iraq war is inclusive). Each of these firms drastically out performed the general stock market. While, I freely admit, it is not a causal observation it is interesting nonetheless. So maybe the next time America goes to war you should shift your personal investments… that is if you can stomach profiting from war. This post is, in part, the product of an honors research effort with a student of mine from the Systems Engineering Department at West Point. The technical paper is currently under peer-review. I will post a link once it is complete.